Developed by Scott Whitley a professional gigging bassist (Big Country and formerly The Animals) the SWB Bass Range is designed to be a professional gigging bassists short scale bass. Traditionally ‘short scale bass’ has largely been associated with student basses and limited, muddy tones – not any more! 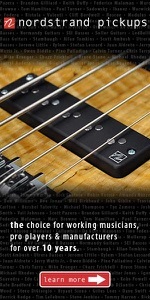 The SWB Pro professional, modern-sounding short scale bass affordable to everyone. The SWB range are incredibly flexible basses to suit any style of playing – from growly traditional through to scooped, hi-fi slap tones and everything in between. Now the SWB Pro takes this to the next level with boutique finishes and a number of significant upgrades. With a matched EMG Jazz Pickup pair and EMG Pre-Amp as standard, this bass features a 5 piece satin walnut and maple neck, wilkinson tuners and ebony fretboard. 39mm nut width. The Fuzzster from Chowny is an incredible-sounding bass fuzz pedal. It delivers a versatile range of filthy tones thanks to its 4 easy-to-use controls, offering great tweakability to find the perfect fuzz sound. Its affordable price-point makes this a pedal that punches well above its weight. Super thick and meaty tones are provided by the Fuzzster, with its Fuzz control letting you dial in just how much gnarly distortion you want. The Tone control lets you brighten the fuzz tone and bring out more treble, so if you want a razor-sharp fuzz that can cut through any mix - crank this control! The Sustain knob adds more depth and can let your notes sing for far longer. So if you want long, bellowing notes to hold the low-end of the mix, just turn this up for never-ending sustain. The Clean control is a really cool feature of this pedal. This allows you to blend in your original unaffected signal to sit alongside the fuzz. So if you want some clarity from your original tone to maintain definition in your playing, yet still want some dirty fuzz to punch through, just use this control to blend between the two! New to the Chowny range is the Chowny Fuzzster Pedal. Commissioned and designed specifically by UK Boutique Pedal makers, and manufactured by us to provide a great fuzz tone for bass. Features levels for Fuzz, Tone, Sustain and Clean Level. Requires 9V DC in.